How it is possible to heal from Endometriosis? It really is possible to obtain a great deal of healing from Endometriosis and to reduce the disabling symptoms. You are the one with ultimate control of your body and your life - and you have an in-built mechanism to support you - your immune system. Where could all this have stated? Some of the bad things that come into our lives, like serious illness, are nearly always a message telling us that something in our life is not right. The body is telling us something, and this shows up as illness or disease. There are many women who develop endometriosis and yet there may be no other members of her family or close friends who have this disease - this is a clue that there is something amiss in a woman's life. Endometriosis could be telling you any number of things, and it will be different for each woman who has this disease. It may be the body reacting to environmental toxins in the area you live, it could be stress overload, or a combination of lots of small things added together. Whatever the external trigger of Endometriosis, internally you have the power, the mental resources and nature’s in-built healing machine - the immune system - all on your side. Healing from endometiosis is a matter of being committed and giving the healing mechanisms time to work. So you also need patience. Each one of us can usually heal ourselves; you can be assisted and guided along the way, but no-one can really heal you but yourself. Remember, that when you cut yourself - your body fixes it; when you catch a virus - antibodies in your body knock them out. Important note: It is a normal healthy immune system that usually mops up the stray menstrual cells in your abdomen. If this does not happen then endometriosis can set in! There are many factors that will come into play when you begin your journey to regain your health and to heal from Endometriosis. You will need to make on-going changes in your life, as well as change the way you are doing things now; you need to nurture your body and give it all the support you can. Your mental attitude* needs to be as positive as possible; you will need support, advice and information; you will need positive feed-back and find positive information of others who have succeeded in regaining their health; and you need to eliminate fear and have more trust in yourself. Meditation may help boost the body’s immune system and produce lasting positive changes in the brain, according to the results of a study undertaken by US researchers. Previous studies have shown that meditation helps reduce anxiety and stress. However, a study conducted by researchers from the University of Wisconsin-Madison is the first to suggest that it may also have positive biological effects on the body’s ability to fight infection and disease. Pursuing goals related to living a meaningful life may boost the activity of certain cells in the immune system, according to a recent study in women. Women who placed more importance on these goals at the beginning of the study had higher levels of activity among their “natural killer” immune cells. In addition, women who elevated the importance of these goals over a one-month period showed increases in natural killer cell activity, compared to women who said that the importance of these goals had decreased for them. An individual's personality type may play a crucial role in how well they can combat disease and infection, say researchers. A study has found that personality type may influence the response of the immune system. Researchers at the University of Pittsburgh School of Medicine tested how 84 volunteers responded to a vaccine for the viral infection hepatitis B. The vaccination stimulates the immune system into action by introducing a tiny amount of the infectious agent into the body. The study participants were also given a test to measure a personality trait called neuroticism, or negative affect. Highly neurotic individuals tend to be moody, nervous and easily stressed. The researchers found that volunteers who scored highly for neuroticism tended to have a lower immune system response to the vaccine. The finding may explain why previous research has found that highly neurotic people tend to suffer more symptoms of disease. Stress and anxiety have a direct impact on levels of hormones such as cortisol which are known to effect immune function. Stress can also bring about behavioural changes - for instance increased alcohol consumption - which can also impact on the immune system. It is also well known that stress will affect the immune system, your digestive system and stress will undermine any chances of healing. When your immune system is working to full capacity, you can fight back and really start the healing process. Working towards healing of Endometriosis will require changes in your life. Some of these changes will be subtle, like changing to a positive mental attitude regarding your health; in other words, aim to have faith that you can get better, which will boost your confidence and enforce your trust and commitment that you will regain your health (as well as boost your immune system as mentioned above). Changes in attitude - to be more focussed on your long term goal of health. Don't compromise on a short term fix. Try to remove things from your life you are not happy with i.e. get out of that job if you hate it, move house if you are not settled there. Seek out support in whatever form that takes i.e. 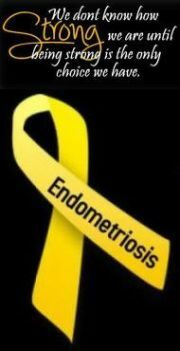 endometriosis support groups, positive reading about getting well from illness etc. Listen to your body, it has much to tell you. If you have a hunch, an intuitive feeling, then follow it. These hunches are more accurate than we ever give them credit for. Do not weaken to the will or demands of others - your doctor may disapprove of any measures you take to be more in charge of your own health but its your body; your family may oppose the actions you are taking regarding self help for your health, or they may demand your attention/time/energy with little regard to how ill you are feeling. Do not give in to these pressures, because that is exactly what they are - PRESSURES. Finally, have faith in yourself. Do not tell yourself that you are not capable of healing and that only other people can do this. Nearly everyone on this planet has the capability to heal, nature built it into our systems, it is hard-wired into our circuitry - if you are given enough support and motivation, this will encourage you to maintain faith in your own healing from Endometriosis. The other key ingredient to regaining your health is to obtain as much support as possible as mentioned above. This support ideally would include some form of alternative/natural therapy. The benefits of getting this support are multi-faceted, some of which can be very subtle. It is not the type of natural therapy you choose which is so important, it is the one which feels right for you that is important. You may be able to do a lot to help yourself, like boosting your immune system through diet, detox or supplements and feeding yourself well, but the value of getting help and support from outside - from another person - has been proved to have enormous added value. The very act of going to see some form of natural health practitioner is healing in itself; before you even take any remedies or medicines being offered. The action you are taking enforces the notion that you are taking control of your own health and doing something about it. These are purely the spiritual benefits of getting help by seeing a natural health practitioner. You also get the obvious health benefits when you start on a programme of treatment. This treatment will focus on giving your body all the support it needs so that your immune system can help you to heal. Every single persons treatment will be different, because we are all different. Therefore your treatment will be tailored to you, and this means it will be the best treatment for you. There is more advice on the subject of healing and how to treat your own endometriosis naturally HERE Yes - really, there is more.